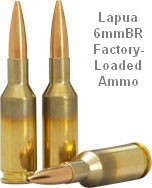 We recently chronographed Lapua 105gr 6mmBR factory ammo in three different 8-twist barrels of similar length. The results were fascinating. Lapua specs this ammo at 2790 fps, based on Lapua’s testing with its own 26″ test barrel. We observed a speed variance of 67 fps based on tests with three aftermarket barrels. Brand ‘S’ and Brand ‘PN’ were pre-fit barrels shot on Savage actions. Brand ‘K’ was fitted to a custom action. All test barrels were throated for the 100-108 grain bullets, though there may have been some slight variances in barrel freebore. With a COAL of 2.330″, the rounds were “jumping” to the rifling in all barrels. 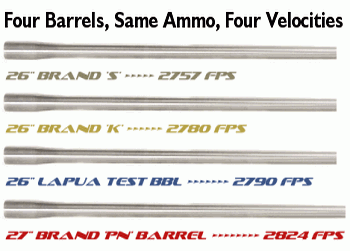 Among the four barrels, Brand ‘PN’ was the fastest at 2824 fps average — 67 fps faster than the slowest barrel. Roughly 10 fps can be attributed to the slightly longer length (27″ vs. 26″), but otherwise this particular barrel was simply faster than the rest. Share the post "Speed Variance in Barrels — You May Be Surprised"
Erik Stecker of Berger Bullets confirmed that his company will be producing a new, high-BC 20-Caliber bullet this fall. The new bullet features a conventional, non-VLD tangent-ogive design for greater seating flexibility and, hopefully, increased precision. The new bullet should be the highest-BC bullet available to 20-Cal shooters from a major bullet-maker. Although production dies aren’t ready yet, Berger has set a 0.400 Ballistic Coefficient design goal for the bullet. That would be a significant step up from Berger’s current 50gr, 20-caliber bullet, which has a published BC of 0.295. We expect the new 55-grainer to require an 1:8″ or faster twist barrel, but the exact twist required will depend on the final bullet dimensions when it is put into production. Expected ship date for the new 55gr bullet is “late August to early September”, according to Stecker. 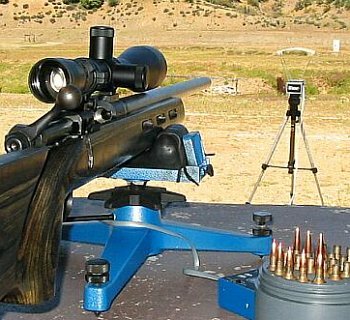 With the correct-twist barrel, the new bullet should work well in most popular 20-caliber chamberings, including 20 VarTarg, 20-223, 20 PPC, 20 BR, and .204 Ruger. Share the post "Berger to make 55gr 20-Caliber Bullet"